Ships from and sold by Semaj Products USA. ✔️ The One With The Fruity Zing! Take advantage of our bulk package. This set of 4, 4oz Sorrel packs is Now Available! The Preferred Caribbean Flavor. 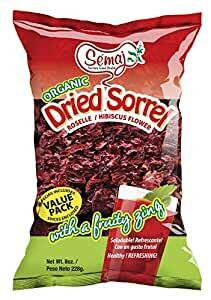 These dried sorrel flowers make the perfect drink for this traditional Caribbean staple. Not to be confused with the vegetable of the same name from temperate countries, sorrel is a favorite West Indian drink for Christmas and New Year. Now you can have it all year round! Great product. Great aromatic and sweet taste. Comes with a spice pack, which makes it very easy to cook, just throw everything in the pot.